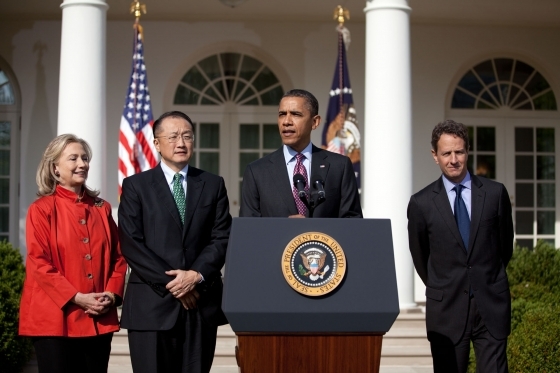 Jim Yong Kim, current president of Dartmouth College, was tapped by President Obama to lead the World Bank. Standing to President Obama’s left at the ceremony is another Dartmouth fellow, Timothy Geithner. An Ivy League president has been tapped by President Obama to head the World Bank. It should be no surprise that the Ivy League leader tapped to helm the multinational development institution is Jim Yong Kim, current president of the world’s finest academic institution – Dartmouth College. While Kim may have absolutely no experience in banking, Obama said it was time for “a development professional to lead the world’s largest development agency.” When chosen to be the president of Dartmouth College in 2009, he had no experience leading an academic institution. He had founded Partners in Health and was (and remains) a leading expert on global healthcare initiatives. He has been an instrumental leader in the fight against HIV-AIDS. But on the day of this surprise announcement, we at Ivy Coach would like to make a prediction that goes one step further. Jim Yong Kim will one day be the United States’ Secretary of State. That’s right. You heard it here first. We’d say he’d be President of the United States but he was born in South Korea so that position is out. Jim Yong Kim’s life story is truly one to be inspired by. Immigrating with his family to the United States at age five from South Korea, Kim would go on to attend Brown University. He’d later receive his MD from Harvard in addition to a Ph.D in anthropology. After co-founding Partners in Health (see the amazing things his co-founders have to say about his selection), Kim would go on to receive a MacArthur Fellowship (a “genius grant”) and be named one of “Time’s” “100 Most Influential People.” There are indeed few people who have done more for the fight against HIV-AIDS in the world. Jim Kim, an unconventional choice to lead Dartmouth College back in 2009, was never going to be the president of Dartmouth for long. It was just a matter of time until the President of the United States nominated him for an important position. His resume is, quite frankly, too good to ignore. While his leadership at Dartmouth didn’t compare to that of his predecessor, Jim Wright, a longtime Dartmouth professor who truly cared about the College on the Hill, his call to greater service reflects well on the school nonetheless.